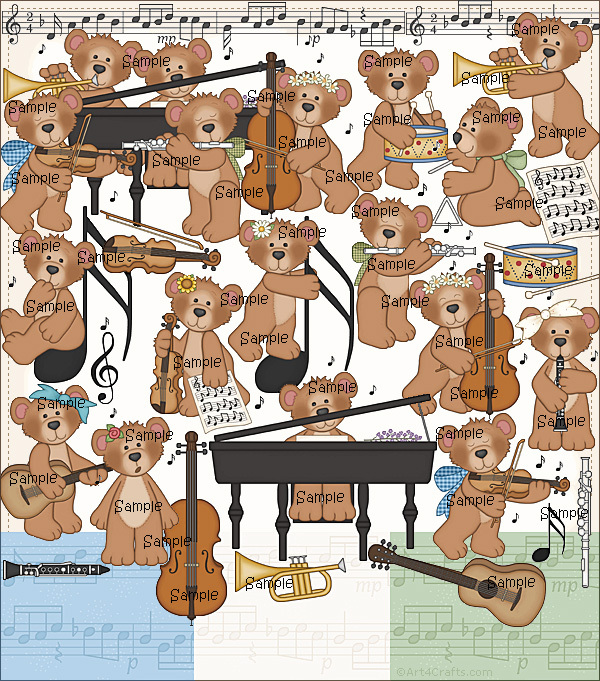 Sweet bears playing various classical instruments and a couple of instruments for smaller childer. Above you can see samples of all the graphics in this set (shown much smaller than actual size). They are in PNG format with transparent backgrounds, and in 300 dpi for excellent printing. Included are also three seamless tile backgrounds (not full pages, which means that to use them you will need to know how to fill a page) and two borders (one transparent and one with green background). Important! If you haven't used my Craft Cliparts before, please download and try these free graphics before you buy. (It's a zip file with some graphics from my other sets.) They are in actual size/quality.